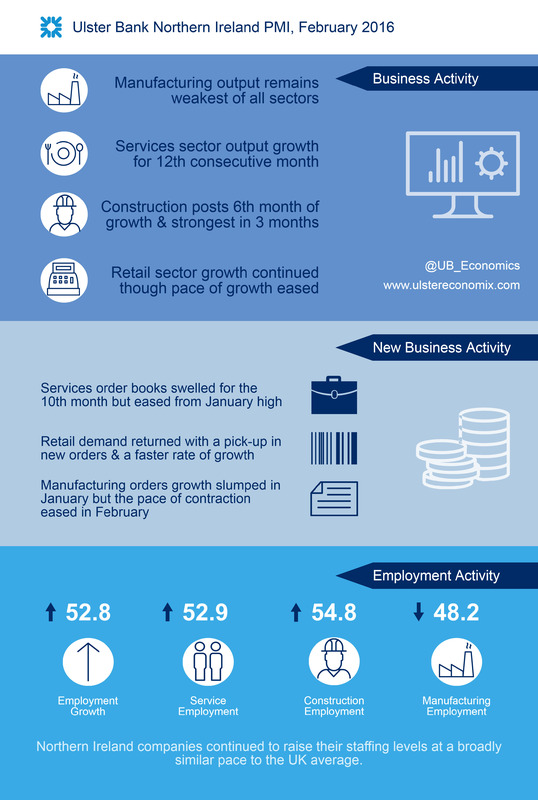 Today sees the release of February data from the Ulster Bank Northern Ireland PMI®. The latest report – produced for Ulster Bank by Markit – signalled that Northern Ireland’s solid start to the year was maintained, with both activity and new business rising at similar rates to seen in January. Furthermore, data suggested sharper increases in Northern Ireland than across the UK as a whole. There were, however, further signs of weakness in the manufacturing sector during the month. “Global economic conditions deteriorated last month according to the latest set of PMIs from Markit Economics. Surveys from the US and the UK reported significant slowdowns in economic activity. The UK PMI saw the pace of growth in business activity slow to its weakest level in almost three years. A slowdown was evident across all sectors. “At a regional level, Northern Ireland fared comparatively better than almost every other UK region. Local firms reported a slight moderation in the pace of growth in output relative to January’s 16-month high. However, unlike the UK, the rate of growth was still broadly in line with the long-term average that pre-dated the downturn. The slowdown in the rate of job creation was more marked but remained above the pre-downturn longer-term average. “Encouragingly, Northern Ireland’s private sector reported a pick-up in new orders growth, with new business rising in February at its fastest rate in eight months. Furthermore, this compared favourably to the UK’s growth rate. Rising demand from the Republic of Ireland was cited as a factor by a number of respondents, which explains the growth in export orders. This is not surprising, given the recent bout of sterling weakness against the euro. A weaker currency is one factor leading to higher input cost inflation. However, the primary driver behind rising input costs is higher wages. Meanwhile the pick-up in demand has restored an element of pricing power for local firms within the construction and service industries. Indeed, service sector firms reported their largest increases in prices last month since September 2008. “At a sector level, local manufacturing continues to struggle, with output, new orders and staffing levels all declining last month. According to the PMI, Northern Ireland’s manufacturing sector is enduring more difficult conditions than its counterparts in Great Britain. Conversely, Northern Ireland’s service sector is outperforming its UK equivalent. Service sector activity accelerated to a 19-month high in February with new orders growth slowing, but still expanding at robust rates of growth. Meanwhile Northern Ireland’s construction firms are still reporting growth in output, new orders and employment, albeit the bulk of this activity remains in Great Britain. However, February’s marked pick-up in new orders – its fastest rate in 18-months – is likely to reflect improving conditions within the Northern Ireland market. Retailers continue to enjoy favourable conditions and the fastest rate of employment growth of all sectors. The headline seasonally adjusted Business Activity Index pointed to a tenth consecutive monthly increase in output across the Northern Ireland private sector, with the rate of growth only slightly weaker than January’s 16-month high. Moreover, the rise in activity in Northern Ireland was faster than the UK average for the first time since July 2014. Three of the four monitored sectors saw activity increase, led by services. On the other hand, manufacturing production decreased for the first time in three months. The rate of growth in new business ticked up in February and was the fastest since June last year. New export business returned to growth in February, with the Republic of Ireland a particular source of new work. With new business continuing to rise, the Northern Ireland private sector saw a further increase in backlogs of work. Higher workloads led companies to increase staffing levels, marking the thirteenth successive month in which job creation has been recorded. Input costs increased sharply again in February, with the rate of inflation remaining much faster than the UK average. Construction and services posted the sharpest rises in input prices. Output price inflation was recorded for the fourth month running, and charges increased at the sharpest pace since March 2014. Click to view the full report and detailed infographic.